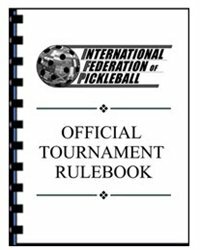 As part of the USAPA membership level that I purchased earlier this year, I was provided a copy of the International Federation of Pickleball Official Tournament Handbook. What better way, I thought, to brush up on pickleball doubles scoring and the rules of pickleball than to review this guide? As I was thumbing through the 56-page handbook, I thought it may be helpful to highlight four different rules and their interpretations that frequently arise on the pickleball courts — and will likely be relevant tomorrow. 9.B. A fault will be declared if, in the act of volleying the ball, a player or anything the player is wearing or carrying touches the non-volley zone or touches any non-volley line. For example, a fault will be declared if, in the act of volleying the ball, one of the player’s feet touches a non-volley line. 12.K. Shots Around the Net Post. If a ball hit at an angle bounces in the court and travels beyond the sidelines, a player may return the ball around the outside of the net post. The ball does not need to travel back over the net. In addition, there is no restriction on the height of the return. For example, a player may return the ball around the net post below the height of the net. If you’re playing and you see me standing on the sideline with a clipboard, don’t try to “pull one over on me.” I’ll have the official tournament rulebook with me — and I won’t be afraid to use it! See you on the courts.